I got on a bit of a cooking kick this week. Nothing fancy, just trying to figure out ways to lessen the food waste and make a minimum of food last through the week. I know there are people out there that are true champions of this. People have their food down to a science of sustainability with menu planners and freezer cooking. I am far from one of these people. I can honestly say that I’m probably the complete opposite of these people. I don’t have a bit of OCD or whatever that might be in me. I’m not a type A personality and I only sometimes wish I was. So, as much as I admire and even aspire to the menu planning/freezer cooking ideals, it goes greatly against my nature. However, I got a bit inspired to take a baby step toward this last weekend by deciding to make a batch of black beans! Yes, black beans! Crazy, right? Hey, it’s a start. I’ve been using canned beans forever and every time there is a voice in the back of my head saying “why aren’t you just cooking your own, for goodness sakes!” I mean I want to get rid of waste (even if I can recycle it)! And I really want to get BPA out of my diet. But, my reason for using canned beans was that I didn’t want to waste the food. But, even using the cans I’d still end up throwing some beans away. So last weekend I got a bug to make a batch of black beans and found some internet advice about freezing them. Of course, it was super easy and I was able to make a few meals and put 2 16oz batches in the freezer for another time. I put everything but the corn into a food processor and blitzed it then added the corn (because the corn was really an after thought). If I make them again (and I’m pretty sure I will), I’ll leave some of the black beans out of the processor and add them after with the corn to add a bit of bulk and texture. The mixture as it was, was a bit wet and I wasn’t sure how it was going to cook up but the burgers turned out delicious. I was really happy with them. I think was secret ingredient was the toasted buns that I put them on. The Sandra Lee recipe suggested reserving some of the mixture for enchilada’s to make the next day. I’ve made enchilada’s a few times in the recent past so this seemed like a great idea, especially since I had half a bag of mozzarella cheese in the fridge that was waiting to be used. All I need to buy was the salsa (I used Tomailla salsa) and the tortillas. Easy! That meal carried over for 2 days, so with my one batch of black beans I was able to make 3 days worth of meals and still have left overs for a few more meals. Not bad for a $1.99 bag of beans. My side for all of these meals was a cabbage salad. Super simple with just cabbage, almonds, seasame seeds and a vinagrette dressing. Following the success of that endeavor I decided to keep the momentum going by cooking up a big batch of tomato basil soup in our crock pot, thinking that I would make enough to freeze. I’m not going to share that recipe because I didn’t think it turned out that great. It just wasn’t what I was hoping for although everyone seemed to like it, Stella especially liked it and kept asking for more. My plan was to serve it with grilled cheese and avocado sandwich’s but that never panned out because we ran out of bread. Instead it was soup (with shredded cheddar cheese on top) and salad night. The next day I was able to serve it to some guests that we had over for lunch and that pretty much used up the batch. I need to spend more time on this recipe because I know I can make a bigger and better batch. 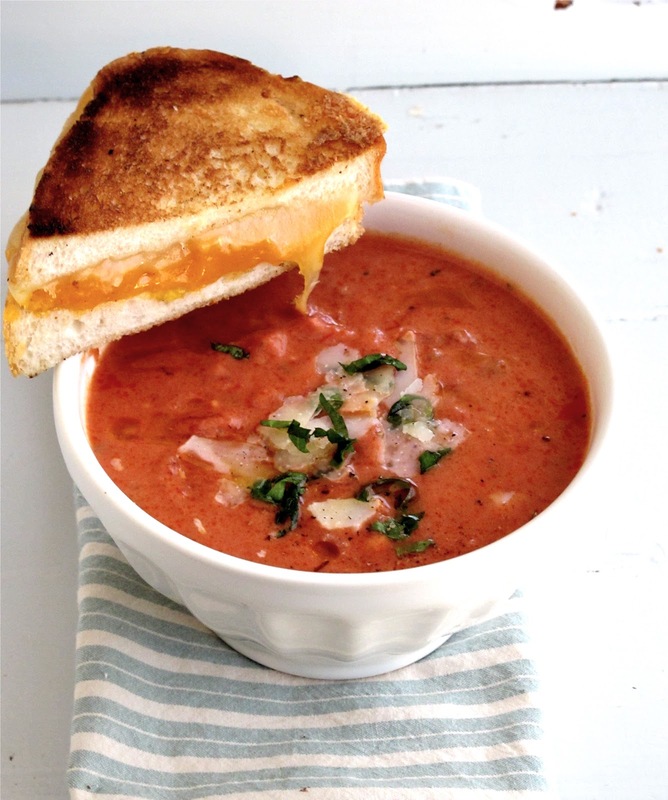 I’ll probably try something like this recipe: http://jennysteffens.blogspot.com/2011/01/recipes-tomato-basil-soup-best-grilled.html. That’s a pic of the recipe, looks yummy! That brings us to last night, Friday. Jim wanted me to make chop chae (a fairly simple korean noodle dish that I’ve made one other time to mixed results) but since I got a really late start I instead decided to stop at Trader Joe’s and get a pork loin and simply made maple glazed pork loin with a salad. Tonight I plan on making the chop chae and using the left over pork to add to it. I thought I was done for the week, but this morning Stella requested Mom’s Home Famous Pancakes (a term she coined herself) for breakfast. So, I decided to make a double batch of those. 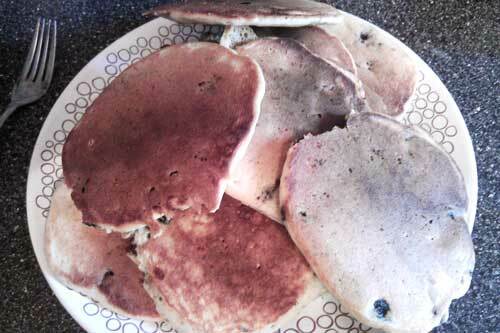 Just a basic pancake recipe from scratch with a bunch of frozen blueberries and fresh banana thrown in. I can keep them in the fridge for a few days and put ’em in the toaster for a quick breakfast. This is perfect since school starts on Monday and we’re going to need to get adjusted to leaving at least an hour earlier than our summer schedule. For next week I’m planning on making a batch of garbanzo beans and seeing where that takes me. I have one recipe for a Mediterranean salad that I’d like to make and I also make a killer, quick, tasty and delicious curried squash stew that should carry us over the next couple of days. So there you have it. My week in food. What are you guys eating? If any one has any suggestions or good habits they’d like to share feel free to leave a comment! Well…doesn’t that look delicious! Thanks for sharing your inspiring thoughts. I love black beans and need to waste less too! I’ve been on a fish taco kick lately so had those for lunch…delish! Tilapia, cabbage, avocado, tomato, jalapeno, lime juice, cilantro…I even made margaritas to go with. My problem is with the GMO corn in the tortillas….know where I can by non-GMO corn tortillas? I’m color correcting a great feature right now…Food Patriots, by Jeff Spitz. It will screen on WTTW in October! I’ll keep you posted! Miss you! Let’s meet up soon for an interesting dining experience! Fish tacos sound amazing! I’ve been eating a lot of avocado and cabbage too. Did you batter/fry the tilapia? Wish I would’ve seen this before I went to the store cause I totally would’ve made that for dinner. And boy could I use a margarita! I’ve posted about Food Patriots before on my events calendar! They had a screening at Uncommon Ground not too long ago that I wanted to go to. Did you go to that? Yes, keep me posted and I’d love to announce it on here when it’s done. Miss you too! Let’s hang out soon. Thanks for being the first person to comment on my blog!